World Predator Classic (WPC) Finland qualifying event was arranged last weekend in Tampere. Perch (3 individuals), zander (3) and pike (1) are the game species in WPC. Total length of fish is measured and photographed and then catch is released back to water. 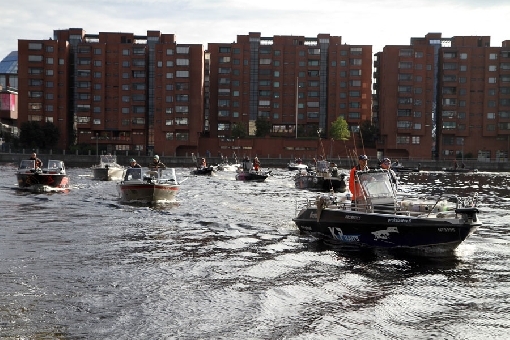 30 boats were fishing on Lake Pyhäjärvi and the fight was hard. The best team ‒ Pekko Kanerva and Valtteri Siren ‒ caught 3 perch, 3 zander and 1 pike with total lenght of 309 cm. Winners got the biggest pike ‒ 79 cm ‒ and they managed to beat the second best team ‒ Antti Pajunen and Salvatore Vitale ‒ by 12 cm. Last podium place was taken by Juha Heininen and Ville Pohjankunnas. Winners will represent Finland at WPC final in Netherlands in 2017.